Our Denali Motorcoach Tour & Rail Vacation Package is the ideal way to travel for people preferring not to drive a car. Travel by van or bus with a interesting group of international clients from Anchorage to Denali National Park while enjoying the scenery, abundant wildlife and great company. Your experienced driver will outline the highlights along the way and answer any questions you might have. You’ll enjoy generous head and legroom, comfortable seating and large picture windows. Plenty of photo and rest stops are made enroute. 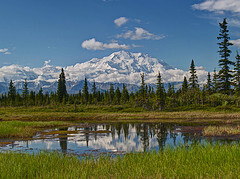 The following day take Denali park shuttle to Eielson Visitor Center or Wonder Lake. Whether you are going to observe the vast array of wildlife or are just going to take in the scenic alpine beauty, you are assured an unforgettable adventure. 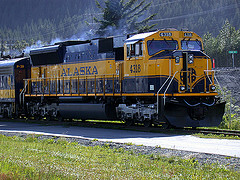 Return to Anchorage onboard the Alaska Railroad or by motorcoach if you prefer. Please Note: the package is also available from or to Fairbanks. Early departure (pre-reserved time) for a full day national park and wildlife observation tour within the shadows of 20.320 ft Mt. Denali to Eielson Visitor Center or scenic Wonder Lake with a immense (best) view of “ the Mountain”. Tour Included ! 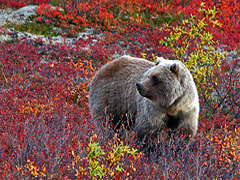 Watch for Grizzly Bears, Moose, Caribou, Wolf and Fox along the ridges and river beds or observe one of the 150 different bird species which inherit the park area. This trip offers some great hiking opportunities. Return to the park entrance anytime during the day. Optional: Exchange to the narrated Tundra Wilderness Tour or the Kantishna Roadhouse Adventure. This is a full day narrated tour along the Park Road to the Kantishna Roadhouse. This trip covers the entire length of the restricted 95-mile Denali Park Road to Kantishna in a private bus. A trained naturalist provides natural history interpretation and assists in search for wildlife while pointing out the regional biology and geology. A lunch at Kantishna Roadhouse is included. Board the Alaska Railroad this morning and relax in your comfortable reclining seats, enjoy a delicious lunch or listen to the commentaries from the onboard tour guide. You'll arrive in Anchorage in the late afternoon. Optional tour extension.